Member or non-member anthropology student. WAPA Members cover an array of subject areas, skill sets, and professional opportunities, but how do we make sure that knowledge gets passed down to new anthropologists? How about a fast speed dating style event where students and recent graduates can seek mentoring advice from local anthropologists? Come and take advantage of the mentoring opportunities that WAPA offers in a fun, relaxed networking environment. Bring your resume and business cards (if you have them) and get real word advice on what’s next in your life as an anthropologists. How will it work? We will divide attendees into small groups of mentors and mentees and rotate throughout the evening allowing you to get one-on-one time from a variety of perspectives. Whether you are a first year anthropology student or post-doc or recent graduate, come explore with anthropologists from all job pools (academic to applied) how you might have a successful career as a professional anthropologist. As always at WAPA, there will be plenty of time to mingle and socialize before and after the event to get the full networking experience! 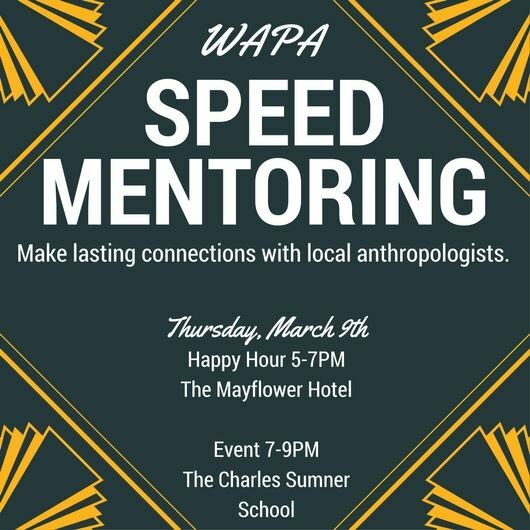 Mentors Present: TBA as they are confirmed, will include many of our WAPA board members, professional anthropologists in the region, and faculty of local universities who focus on professional anthropology work. If you are a student, but not a member, consider signing up for a 2017 membership at the student rate of $20. This is just one of several events we have throughout the school year to support anthropologists in the greater DC region.